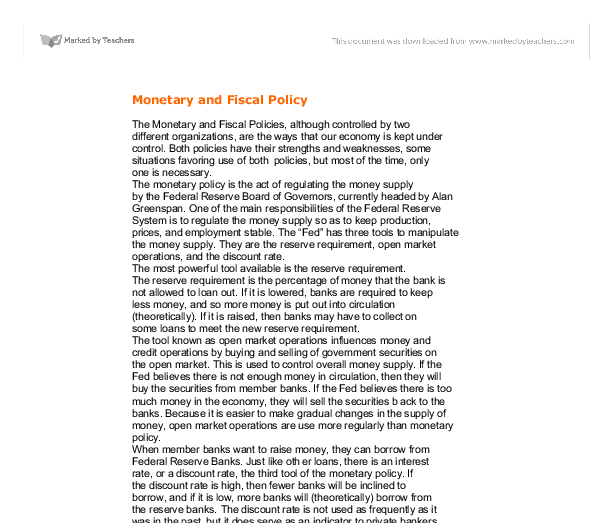 Monetary and Fiscal Policy The Monetary and Fiscal Policies, although controlled by two different organizations, are the ways that our economy is kept under control. Both policies have their strengths and weaknesses, some situations favoring use of both policies, but most of the time, only one is necessary. The monetary policy is the act of regulating the money supply by the Federal Reserve Board of Governors, currently headed by Alan Greenspan. One of the main responsibilities of the Federal Reserve System is to regulate the money supply so as to keep production, prices, and employment stable. The "Fed" has three tools to manipulate the money supply. They are the reserve requirement, open market operations, and the discount rate. The most powerful tool available is the reserve requirement. The reserve requirement is the percentage of money that the bank is not allowed to loan out. If it is lowered, banks are required to keep less money, and so more money is put out into circulation (theoretically). ...read more. The monetary policy is a good way to influence the money supply, but it does have its weaknesses. One weakness is that tight money policy works better that loose money policy. Tight money works on bringing money in to stop circulation, but for loose policy to really work, people have to want loans and want to spend money. Another problem is monetary velocity. The number of times per year a dollar changes hands for goods and services is completely independent of the money supply, and can sometimes contradict the efforts of the Fed. The benefits of the monetary system are that it can be enacted immediately with quick results. There are no delays from congress. Second, the Fed uses partisan politics, and so has no ties to any political party, but acts in the best interests of the U.S. Economy. 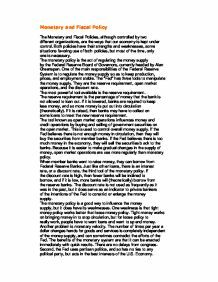 The second way to influence the money supply lies in the hands of the government with the Fiscal Policy. The fiscal policy consists of two main tools. ...read more. Because a tax cut can take a year to really take effect, the economy could revive from the recession and the new unnecessary tax cut could cause inflation. Politics are another problem. Unlike the monetary policy run by the partisan Fed, the fiscal policy is initiated by the government, and so politics play a key role in the policy. When the concerns of the government are viewed, it becomes obvious that a balanced budget is not the primary objective, anyway. The fiscal policy can also be used as a campaign tactic. If tax cuts are initiated and government spending is increased, then the president is more likely to be re-elected, but has first to deal with the inflation his tactic caused. Monetary and fiscal policies are what helps keep the nation's economy stable. With them it is possible to control demand for services and goods and the ability to pay for them. It is possible to manipulate the money in private hands without directly affecting them. The policies are simply a myriad of tools used to prevent a long period where there is high unemployment, inflation, and prices, along with low wages and investment. ...read more. The fact that the CPI has kept inflation low over the past 15 years has also effected unemployment. The CPI has also provided a stable environment for jobs and growth, which shows that monetary policy is effective in keeping "low unemployment" - one of the macroeconomic objectives. This lack of growth may be attributed to effects from job growth; tax cuts and lower interest rates. The rate of economic growth means the percent change in Real Gross Domestic Product (RGDP). The low GDP can also be attributed to consumption, investment and government expenditures and net exports. 2.
this means that an increase in money supplied will cause an increase in prices but an increase in prices wont cause an increase in the money supplied. This then shows that if the amount of money supplied to an economy is increased then prices will inevitably go up. Discretionary (or structural component) is changes in fiscal policies that are deliberate changes such as reduced spending or changing taxation rate. Discretionary changes influence the structural component of the Budget outcome. 5. Automatic Stabilisers Automatic stabilizers are those changes in the level of government revenue and expenditure that occur as a result of economic activity. The related factors of fiscal policy we will mention here range from the direct taxes in the taxation area to the exchange rate in the market area. Here in this report we just focus on the taxation policy.